Hunter’s Brewery’s collaboration with men’s grooming products company, The Bluebeards Revenge, has gone on sale in Plymouth Wetherspoon pubs. It has been launched in: the Stannary Court, Plympton; the Mannamead, on Mutley Plain; the Barbican’s Gog and Magog; the Britannia, on Wolseley Road; and the Union Rooms, in the city centre. Made with Citra and East Kent Goldings hops, combined with malted barley and wheat, the beer is bottled conditioned and weighs in at 5.1% ABV. On Saturday evening (November 28) the Stannary Court will be hosting a launch event, with fun, prizes and beer tasting. 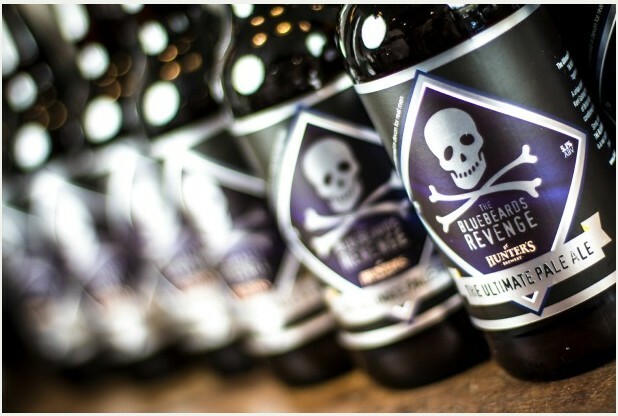 David Hildrew, managing director of The Bluebeards Revenge, said: “It would have been easy to get a white-label brewer to smack a few Bluebeards labels onto an existing brew, but that is simply not our style. “We wanted our very own, unique beer brewed by a brewery with excellent credentials, and with a route to market so that our beer could be on sale in pubs and supermarkets across the land.